Around two weeks ago, a very beautiful,red triangle box came to my office. This box captured everyone's attention, even the male colleagues! Hahaha. This box is from First Blush; the latest Indonesian beauty box! 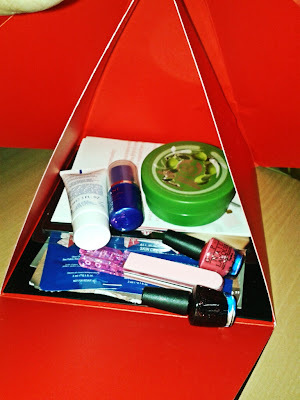 I'm quite sure you are already familiar with this box since there are so many beauty bloggers receiving this box as well. Let's see how the box is first. 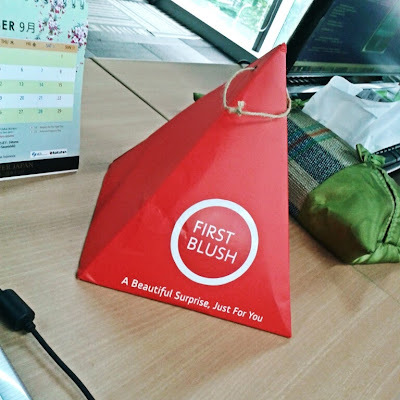 The box's shape is quite unique, unlike any other beauty box, it comes in triangle packaging. The red color also adds some bright, happy feeling when receiving this, so far I love the packaging design! 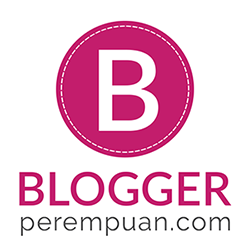 In the middle of its triangle shape, is the First Blush simple, yet stylish logo. And when you open the box, actually there was this round tag hanged around the upper corner of the triangle. So cute! Unfortunately the thread didn't hold it well, so it's cut unaccidentally when I open the box. Let's take a peek inside!!! 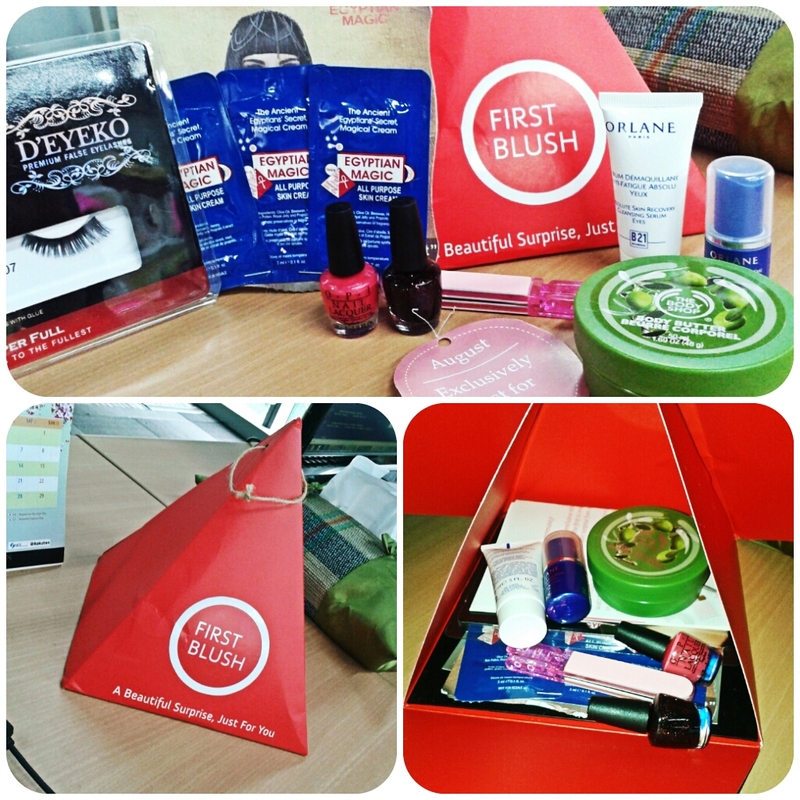 Most of the products inside are mini or travel size instead of sachet, which makes me glad. I personally hate sachet size, since it doesn't worth subscribed for then.. So, which product is my favorite? 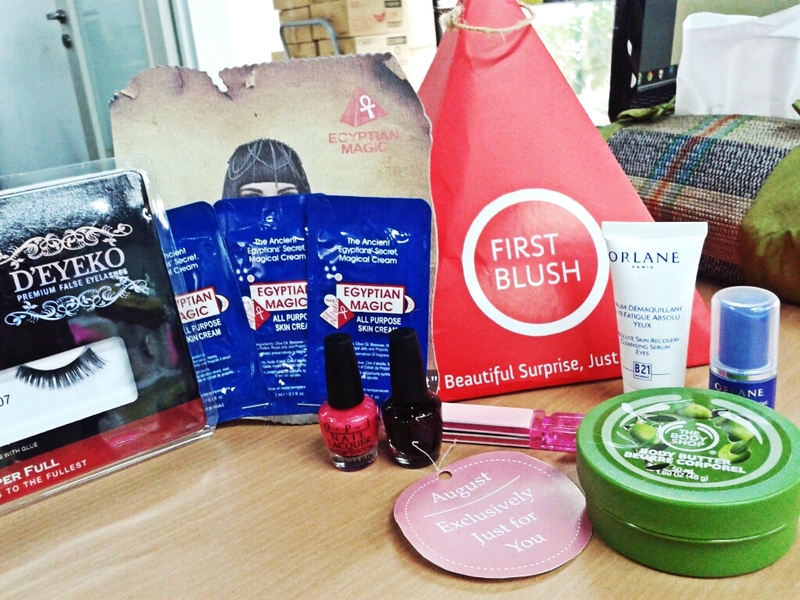 My favorite is Orlane Extreme Line Reducing Lip Care since I am previously used that and lucky me, now that I'm running out of that, I got another travel size from First Blush! Thankies! What's new for me is the O.P.I Minis, truth to be told, I am never a big fan of nail art, let alone nail polish.. I think I'm just not that talented in nail art thingy. Hahaha, but receiving this great nail polish brand might encourage me to learn, right? 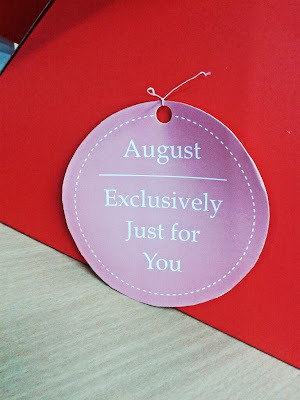 There are also some beauty and discount vouchers inside, but I am not really interested in vouchers, ehehehe. 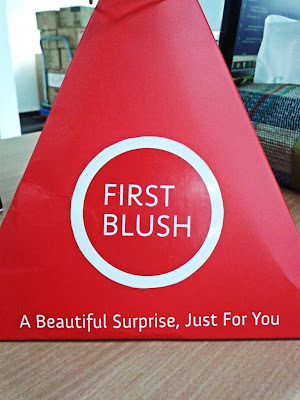 Are you interested in subscribing for next First Blush box?